Video game technology has evolved immensely over the past three decades and, not surprisingly, the video game industry has experienced significant growth. Today's games come in a wide range of formats, including consoles, computer programs, web-based platforms and smart device apps. In 2015, the video game market in the United States was valued at nearly $17 billion. According to the U.S. Bureau of Labor Statistics, software developers -- including video game designers -- accounted for more than 1.2 million jobs nationwide in 2016, and can expect to see an occupational growth of 24% between 2016 and 2026. Most designers specialize in niche areas of game development, such as initial storyboarding and scriptwork, computer-based modeling, animation, coding, and quality assurance testing. Video game design has become a popular academic choice for college students with an interest in technology, art, and graphic design. Some programs follow a generalized curriculum, while others allow students to pursue concentrations in their specific areas of interest. Many video game design bachelor's programs culminate in a capstone project or portfolio presentation, and students commonly pursue industry internships as well. A large number of today's students are choosing to earn their bachelor's degree in video game design online. Web-based students follow the same rigorous curriculum as their on campus counterparts, qualifying them for equal job opportunities after graduation. Many online programs follow an asynchronous, or self-paced, schedule, ideal for students with part-time jobs, childcare responsibilities, and other commitments that would interfere with campus-based learning. Learn more about what you can do with an online bachelor's degree in video game design and what kind of career opportunities you can look forward to with this comprehensive guide. WILL AN ONLINE VIDEO GAME DESIGN BACHELOR'S PROGRAM PROVIDE ME WITH THE SKILLS I NEED TO ADVANCE MY CAREER? Bachelor's in video game design programs provide a comprehensive overview of this cutting-edge field. Students take courses in game conceptualization, drawing and animation, computer programming, and other related fields. Once they have completed their core course requirements, many students pursue a concentration in their specific area of interest. They can boost their career opportunities with an internship, which provides supervised onsite training from experienced industry professionals. Graduates who earn specialized degrees and complete internships are well-positioned to enter the competitive job market for video game designers. WILL AN ONLINE VIDEO GAME DESIGN BACHELOR'S PROGRAM WORK WITH MY SCHEDULE? Online bachelor's programs in video game design offer a flexible alternative to classroom-based education. Students can access course lectures and readings, participate in moderated virtual discussions with other students, submit assignments, take exams, and contact their professors from the comfort of their home. Current technology also allows students to complete coursework on the go using a laptop, tablet, smartphone, or other WiFi-capable device. For added convenience, online students can typically coordinate internships at sites near their current residence. Distance learners also enjoy access to web-based portfolio and capstone advising services. WHAT JOBS CAN I GET WITH MY VIDEO GAME DESIGN BACHELOR'S DEGREE? Most careers in video game design require candidates to hold a bachelor's degree or less. Specific job titles vary by degree specialization and field of expertise. For example, artistic students may gravitate toward careers in video game art, animation, or design. Alternatively, graduates with tech skills often find their calling in video game design, with careers in software development or computer programming. Other pathways include scriptwriting, music composition, and marketing. WHAT ARE THE BEST ONLINE VIDEO GAME DESIGN BACHELOR'S PROGRAMS? Choosing a program is a personal decision, and only you can properly evaluate whether a target school's strengths match your educational needs. The following ranking of schools are a helpful starting point in your search for the best online bachelor's programs in video game design in the United States. 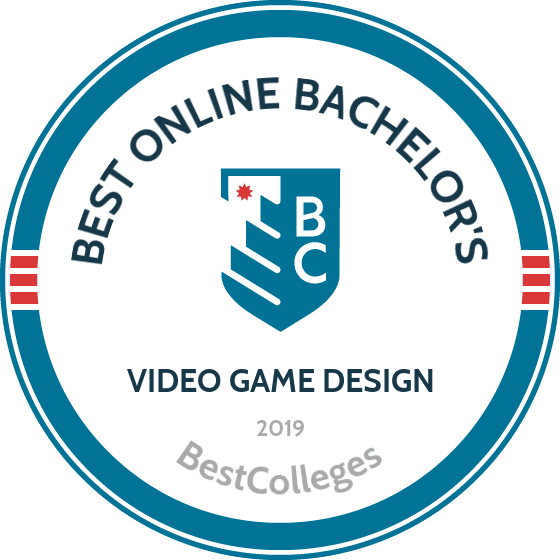 If you are considering an online bachelor's in video game design, make sure to contact admissions specialists at different colleges and universities to learn more their about specific bachelor's degree requirements and offerings. Liberty University, a private evangelical college created in 1971 by Rev. Jerry Falwell, offers more than 550 programs from its campus in Lynchburg, Virginia. Individuals looking to break into the field of game design can pursue an online bachelor of science in information technology -- gaming design through a program offered by the school of business. Liberty's 120-credit program lets students earn their online game design degrees in as few as three and a half years. The college, which began its distance learning programs in 1985, offers eight different start dates every year. Courses run in eight-week sessions and explore the necessary computer science, programming, and graphic design skills for landing entry-level jobs in the gaming industry. Students can transfer up to 75 credits. Part of the program's 39-42 general education requirements include Christian life and thought courses, including introduction to theology survey, Christian life and biblical worldview, and survey of the Old and New Testaments. To apply, students must pay the application fee, show proof of at least a 2.0 GPA, submit unofficial college transcripts or a high school certification form, and provide proof of English proficiency. Once admitted, students must submit official transcripts. To help defray the costs of college, Liberty provides undergraduate students with free electronic textbooks. Liberty also offers tuition discounts to active and retired military students, as well as military spouses. Military students can also receive college credit for military training. Lindenwood University, an independent school founded in 1827, is located in St. Charles, just outside of St. Louis, Missouri, with another campus in Belleville, Illinois. The college features 131 programs, including the online bachelor of arts in game design degree offered through the art and design program. Lindenwood's online game design degree follows an asynchronous format, which gives students the flexibility to take classes and view lectures when their schedules permit. Students can opt for the fully online program or a hybrid program with some in-person classes. The 54-credit program introduces students to the foundations of game design, in addition to courses in exploring 3D graphics and programming logic. Students also take art history courses and specializations in concept design and game development. While the college maintains ties to the Presbyterian Church, the curriculum does not have a Christian focus. To earn a bachelor's degree, each student must complete 120 credits in total with a cumulative 2.0 GPA. Learners must also complete a three-unit game design capstone project and a three-unit game design internship to receive an online game design degree. These courses allow students to build a portfolio, network with professionals, and gain work experience with a gaming company. Founded in 1932, Southern New Hampshire University enrolls more than 90,000 online students and 3,000 traditional students in over 200 programs. The online bachelor's in game art and development, which runs on six eight-week terms, allows students to take classes completely online with asynchronous coursework. The curriculum delves into the fundamentals of video game art and design. Students learn to use industry software to explore the basis of lighting, shading, 3D modeling, digital painting, 3D mesh topology, and rigging. The 120-credit program culminates with a game art and development capstone, which challenges students to demonstrate their new knowledge and skills. Throughout the program, students build a portfolio featuring their original designs and samples of 3D worlds. Graduates can use their portfolios to land jobs as animators, designers, lead artists, and lead storytellers. During the program, students explore software such as Maya, 3ds Max, MotionBuilder, and Mudbox, which they can download for free. The program also emphasizes general education courses in writing, communication, analysis, and problem-solving. To apply, each candidate must submit an online application and pay a fee. After filling out an application, prospective students speak to admissions counselors. Applicants receive admission decisions within days of applying. Students do not need to submit transcripts since SNHU will retrieve the transcripts from each applicant's school. SNHU accepts up to 90 transfer credits toward an undergraduate degree. Savannah College of Art and Design, a private nonprofit college founded in 1978, prepares students for creative professions. The school offers more than 40 majors and 75 minors. SCAD features two degrees in game development. The BA and BFA in interactive design and game development offer in-person classes in Atlanta, Savannah, and Hong Kong, in addition to courses available completely online. Students can pursue bachelor's degrees in digital media with a concentration in game development or interactive game design, as well as a bachelor of fine arts in interactive design and game development. Both online game design degrees require students to complete 180 credits. These bachelor's degrees begin by teaching students the fundamentals in color theory, design, and drawing. Students also take general education courses in a two-year sequence to explore digital fluency, strategic communication, cross-cultural knowledge and engagement, historical investigation, and leadership, and research and analysis. SCAD accepts applications throughout the year. Applicants receive admission decisions within 2-4 weeks. After applicants submit an online application and an application fee, an admissions adviser will contact them. Each application must include official transcripts, proof of English proficiency, three letters of recommendation, a statement of purpose, and a resume. The college may require students to take part in interviews over the phone or in person. Applicants can also submit a portfolio and resume through SlideRoom to apply for scholarships. SCAD accepts a maximum of 90 transfer credits. The University of Baltimore, a public college founded in 1925 and located in the heart of the city, emphasizes "career-focused education." The school offers more than 70 programs and certificates. The university's bachelor of science in simulation and game design program, which began in 2003, follows a hybrid format. While students can access classes online, they also need to travel to the main campus in Baltimore or the Universities at Shady Grove campus for weekday classes. Students enrolled in the online game design degree can choose between two specialized areas of study: technical art or coding and development. To earn a degree in simulation and game design, students must complete a total of 120 credits, including 38 general requirements in math, English, humanities, and social and biological sciences. Learners also must complete 39 core requirements in classes such as introduction to game design and game scripting. Students then complete 15 credits in 3D art, production, and coding. The curriculum also requires a capstone project, which lets students work with professionals in the field. Applicants must submit an online application, an essay or personal statement, and high school or college transcripts. First-year student applicants must submit SAT or ACT scores. Students who graduated from high school three or more years ago can submit a resume and two letters of recommendation in lieu of test scores. UB accepts a maximum of 90 transfer credits. The college automatically considers first-year students for merit scholarships of up to $6,000 per year and transfer students for merit scholarships of $3,500 per year. Depending on the program you choose, you may take a variety of courses to learn how to plan, design, test, and evaluate games. The best online video game design schools often offer similar class options. Below are five examples of common courses in video game design curricula. Introduction to Scripting: Students learn about data types, decision statements, inputs and outputs, and other concepts critical to effective programming and scripting. Students typically develop simple scripts of their own, while also building lists, regular expressions, and literals. The course provides a foundation for more advanced computer and game design classes. Usability Testing for Games: Students learn about best practices and accepted methodologies in testing video games, along with common problems related to game interfaces. The course typically includes both a lecture and lab component, allowing students to gain exposure to both theoretical and real-world insights. Students may explore testing across various formats, including mobile. Foundations of Game Balancing: This course focuses on gameplay fundamentals and level design methods to help learners understand how to strike a balance in the games they design. Students map out a design direction while learning how to communicate to players through a game's interface. They also learn when to cut out duplicate or unnecessary features in a game. Advanced Game Mechanics: Students explore game rule-based systems and how they create engaging challenge and reward experiences for users. Examples include a problem-solving testing method, which evaluates all aspects of a game to determine whether it suits its target audience. At the end of the course, students understand how to make cohesive game design decisions using an effective process. Level Design: This course teaches students how to evaluate various game levels and determine whether they meet basic requirements for engaging gameplay. This process involves analyzing each level's purpose, function, and meaning to the overall game experience. Additional components include pacing and flow, setting clear level objectives, and creating the best possible visuals. How Long Does It Take to Get an Online Bachelor's in Video Game Design? Many factors influence how long it takes to complete an online bachelor's in video game design. Individually paced programs permit students to take more classes per term and potentially graduate at a quicker rate. Cohort structures require students to take classes with a group of other learners. Cohort models don't allow you to expedite your degree, but they can provide critical peer support and facilitate connections that may benefit your career well into the future. Most online video game design schools require students to complete 120 credits for a bachelor's degree. These credits include general education courses, which students can take at a community or junior college to reduce the total cost of tuition. Other credits include subject-specific core courses and electives. How Much Does an Online Bachelor's in Video Game Design Cost? Many programs offer video game design classes online, but often charge considerably different tuition and fees. You can generally expect to pay between $16,000 and $40,000 per year in tuition, though many institutions charge different tuition rates for in-state and out-of-state residents. You may also need to pay additional fees for technology, textbooks, healthcare, and student activities. Closely examine tuition and fee expenses for each prospective college and university when researching potential online video game design schools. Some online video game design schools require students to take part in additional experiences beyond their core and elective courses, usually a capstone or final project, where students use what they learned in their coursework to create games of their own. Students often start their project as soon as they begin classes. Other programs may require an internship, which enables students to learn firsthand from real-world video game designers and developers. Check each program on your list for these additional requirements. Obtaining an online video game design degree from an accredited college or university shows potential employers you received a quality education. Postsecondary institutions may receive regional or national accreditation from one of several accrediting agencies. Most schools seek regional accreditation, which is generally considered more prestigious than national accreditation; however, nationally accredited schools also offer solid programs, and they tend to provide affordable tuition and plentiful online course options. Keep in mind that most regionally accredited schools do not accept credits from nationally accredited institutions, in case you wish to transfer at a later date. When considering online video game design schools, look for regional accreditation from the Middle States Association of Colleges and Schools, New England Association of Schools and Colleges, North Central Association of Colleges and Schools, Northwest Accreditation Commission, Southern Association of Colleges and Schools, or Western Association of Schools and Colleges. Reputable national accrediting agencies include the Distance Education & Training Council, Accrediting Council for Independent Colleges & Schools, and Accrediting Commission of Career Schools and Colleges. Two entities ensure that regional and national accrediting agencies maintain an adequate level of rigor in assessing colleges and universities. The U.S. Department of Education (ED), a federal government agency, keeps complete records of accredited institutions, though it does not directly provide accreditation. Find a list of all regionally and nationally accredited schools at the ED's website. Additionally, the nonprofit Council for Higher Education Accreditation features a membership of more than 3,000 academic institutions and advocates for quality in self-regulated accreditation practices. Industry projections indicate a strong job outlook for video game designers in coming years, particularly in software development, computer programming, and other tech-based subdivisions. Using data from U.S. News & World Report, the following table explores unemployment rates for some of the most common job titles in video game design. The average unemployment rate of the careers listed above is 2.95%. By comparison, the national unemployment rate for all occupations is currently 3.7%. Like employment rates, earning potential in the video game industry largely depends on each employee's undergraduate degree and area of expertise. The table below features salary expectations at two career benchmarks for students who major in tech and creative fields associated with video game design. All seven bachelor's degrees listed above experience at least a 52% salary growth between the entry-level and mid-career stages. Film, video, and media studies degree holders see the highest growth rate: a salary increase of 71% after 10 years on the job. Creative writing majors place second, with a 66% growth rate. In addition to the undergraduate major, job title also affects annual earnings and salary growth potential. Other factors to consider include company or organization size and geographic area of employment. The table below looks at career salary projections for five of the most popular pathways in video game design. Among the five careers listed above, video game designers experience the highest rate of career salary growth: a 75% earnings increase between the entry-level and late-career stages. Computer programmers rank second, with a 71% increase in salary after 20 years on the job. Career salary growth for art directors, animators, and user interface designers ranges from 24% to 37%, despite slight dips in earnings for each occupation between the experienced and late-career benchmarks. Students who graduate with a bachelor's degree in video game design qualify for dozens of entry-level positions, though job eligibility depends on each candidate's area of expertise. Four of the most common career pathways in video game design are outlined below. Software developers design, create, and evaluate a wide range of computer-based programs, including games. Once they complete the conceptualization stage, they use models and diagrams to instruct computer programmers on proper coding sequences. They also perform a wide range of tests to ensure their programs are functional and user-friendly. Web developers oversee construction of websites, from initial back-end coding and conceptualization to finishing layout touches like graphics and multimedia. They also run tests to measure how much traffic a site can handle and ensure all tools and widgets are working properly. Web developers often generate site content, as well. In the video game industry, art directors oversee all visual components of a given project. They manage teams of artists, graphics developers, animators, and other creative technicians. They may also help design cover art, promotional brochures, and other marketing materials. These creative professionals work on the visual components of video games and other forms of media at many stages, including conceptualization, drawing, storyboarding, three-dimensional modeling, animation, and motion-capture effects. Making professional connections and learning about different approaches to video game design is crucial to your success. Professional organizations offer a great entry point for students who want to learn more about their chosen career path. Below you'll find three of the country's most prominent organizations established for professional video game designers. These organizations host networking events, provide online trainings, maintain active job boards, and offer other services for career-ready college graduates. Officially established in 1994, the IGDA now hosts professional and academic chapters in more than 100 cities worldwide. Student members can take part in the IGDA Scholars program, while organizations can receive benefits such as studio affiliates or partners. The ESA specializes in areas like content protection, advertising, consumer outreach, and intellectual property advocacy. Its website includes job listings, information about video game policies, and an online newsroom. The VGDA offers professional development opportunities in niche areas of gaming design, such as art and visuals, animation, and story conceptualization. The association's website also features an extensive blog highlighting various industry trends and projections. Despite the relative affordability of online programs, most distance learners still need financial assistance. These students should complete a Free Application for Federal Student Aid (FAFSA) to learn more about loans, grants, and other opportunities offered through the U.S. government. They can also explore private grant and scholarship opportunities from nonprofit organizations, companies, and other sources. Check out our collection of resources below to learn more about financial aid options. Approximately two-thirds of today's college students rely on loans to fund their education, but plenty of overlooked financing options can reduce your overall student debt. Completing the FAFSA is a crucial first step for any student with financial needs. Our FAFSA guide features a step-by-step rundown on the process, plus answers to several frequently asked questions. Financial aid for online learning is equivalent to what you'll find for campus-based learning, but that hasn't always been the case. Learn about the changes that have taken place, along with the funding opportunities available to online students. Online programs provide affordable, flexible options for women trying to balance the demands of work, family, and earning their degree. We've curated a list of valuable scholarships specifically for women. Online college programs offer a flexible, affordable alternative for single parents interested in earning a degree to secure their family's financial future. We've compiled a list of scholarships, grants, and other financial aid options geared toward single moms and dads.